The ginseng coffee hurts or the body good? Might be an alternative to the regular one? Has the same effect? But how is it produced? Questions related to Ginseng are many and in this article we will try to provide an answer to fans of this drink. We set off from the source of Ginseng, right from the tree until you get to the everyday consumption of ginseng coffee and the popularity it has had in years. Scientific name Panax, ginseng is the root of a perennial plant native to mountainous regions of Asia and some habitats in North America. According to the source, ginseng is divided into red ginseng (Panax ginseng), coming from Asian countries and with a greater amount of active ingredient, and white ginseng (Panax quinquefolia), coming from North America. Ginseng root contains many substances and active ingredients from tonic: ringside ginsenosides, compounds from which ginseng derives most of its property; but we cannot fail to mention other substances such as the B vitamins and vitamin C, A, E, and K, germanium and manganese, peptides, saponins, pollen, trace elements and amino acids, folic acid. This list alone is enough to understand how much ginseng is a treasure trove of beneficial elements, a lifesaver for the human organism. Studies confirm that, when taken in moderate amounts, ginseng doesn’t hurt. 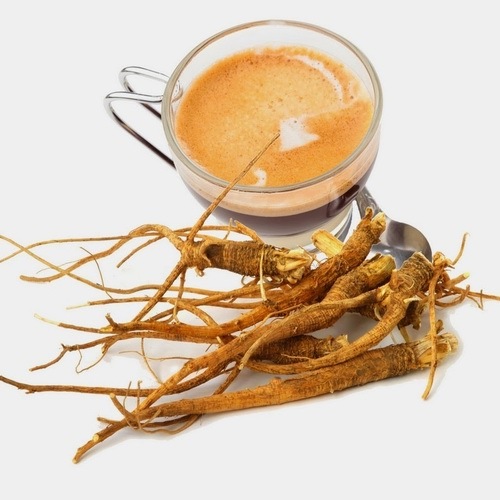 Its beneficial properties are numerous and include only the main: is stress and improves mood, is a tonic with revitalizing effects and increases concentration, speed of reaction and the immune system; It’s also a great aphrodisiac and an ally against cellular aging. Unlike the traditional coffee is suitable to be consumed even for those suffering from insomnia or nervousness because it contains less caffeine, besides giving vitality relaxes the nervous system and combats anxiety. It is also a powerful adaptogen natural, increases the strength and the body’s natural defences stimulating it to endure stressful situation and react in a productive way. It reduces hunger and can be helpful for people who follow a low-calorie diet.